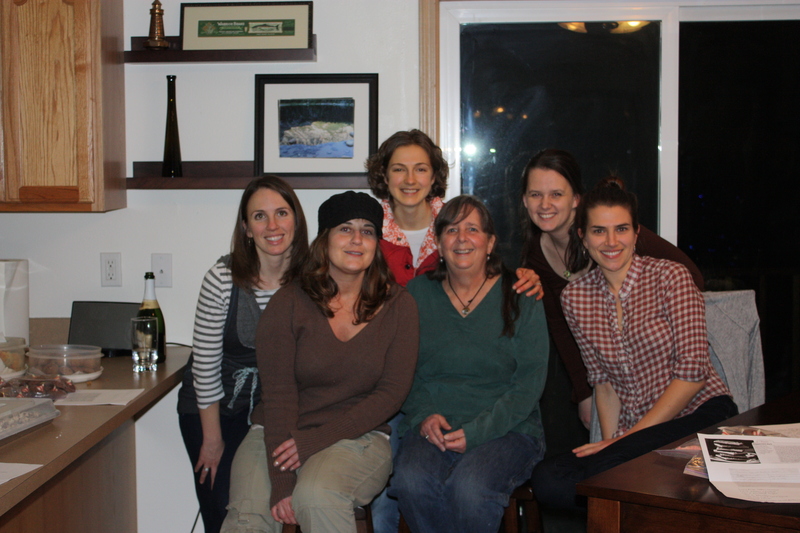 Christine, Chailly, myself, Brenda, Melissa, Christina - full, fat and happy! I was invited to a cookie exchange the other night and here is how it works: You make your cookie and bring enough cookies to the party so that at the end, each guest gets to take home 1/2 dozen of each type of cookie as well as the recipe! It was a great time and the cookies that were made were unique and quite delish – Triple Ginger Gingersnaps (my contribution, see recipe below), Chocolate Crackle Cookies with Peppermint Kisses, Oatmeal Cookies with White Chocolate and Walnuts, Peppermint Bark, Molasses Cookies, Lavender & Earl Grey Scones, and the hit of the party . . . Bourbon Balls. 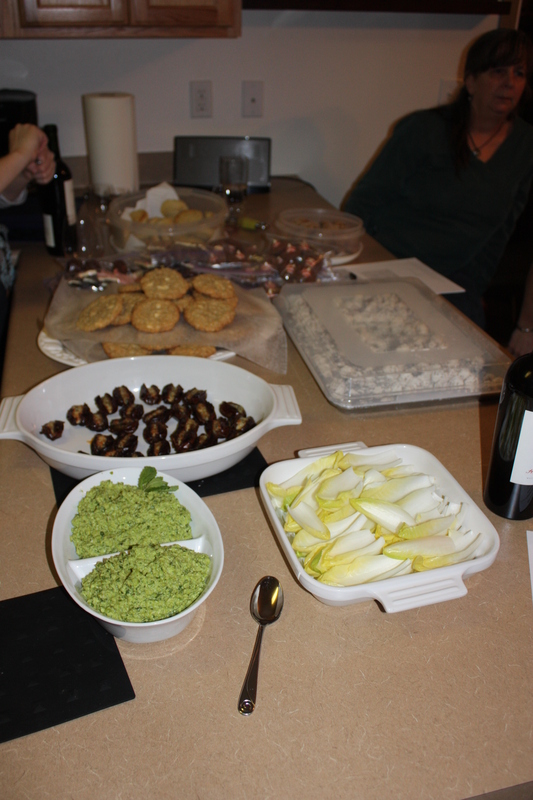 the plethera of cookies ... and the phenomenal edemame hummus! Makes twenty to twenty-two cookies. 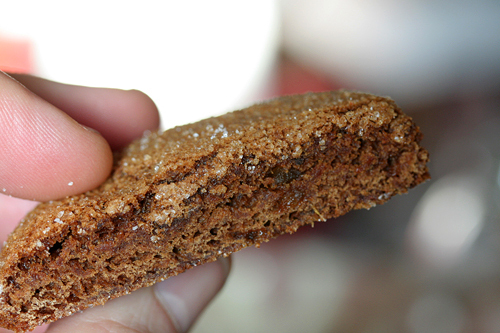 The name ginger-snaps may lead one to think these are crispy, but they’re not. I don’t like crispy gingersnaps. If you like thicker, denser cookies, cook 1/2 cup applesauce down to 1/4 cup or use apple baby food. Because these are meant to be soft cookies, watch them like a hawk during the final moments of baking. Since all ovens are different, take them out just when they feel like they’re starting to set and feel just slightly firm in the center, which you can tell by touching one gently with your finger. 1. 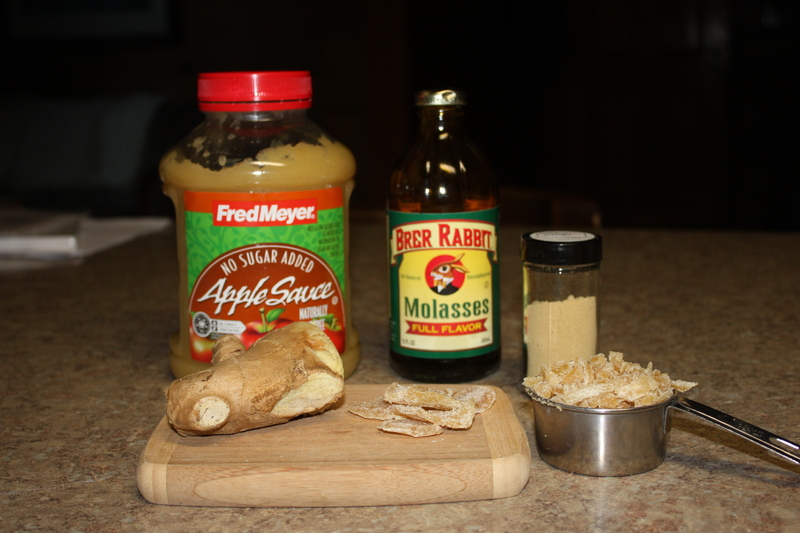 In the bowl of a standing electric mixer, beat the brown sugar, applesauce, fresh ginger and molasses for five minutes at medium speed, with the paddle attachment. 2. Meanwhile sift together the flour, baking soda, spices, and salt. 3. After five minutes, stop the mixer, scrape down the sides, and add the egg whites. Beat another minute. 4. With the mixer at its lowest speed, add the dry ingredients until completely incorporated, and mix on medium for one minute more. 5. Stir in the chopped candied ginger. Chill the batter very well. 6. To bake the cookies, preheat the oven to 350F. 7. Line two baking sheets with parchment paper or silicone baking mats. 8. Pour some granulated sugar in a shallow baking dish. Scoop the cookies into heaping tablespoon-sized balls (about the size of an unshelled walnut) and plunk them down into the sugar. Afterward, use your hands to form the dough into sugar-coated balls: don’t be shy with the sugar either. It not only helps to shape the sticky dough, but makes a lovely crust for the finished cookies. 9. Put the cookie mounds evenly-spaced on the two baking sheets, leaving room (at least 3-inches, 8cm) between them to spread. 10. Bake for 13 minutes, or until the cookies feel just barely set in the center. Remove from oven and cool. Storage: You can keep the cookies in an airtight container for up to five days. The batter can be chilled for a week, or frozen, for up to two months, well-wrapped. 1 Response to It’s a Cookie Exchange! MMMM they loook wonderful Rachel! I love soft chewy cookies too! I made lots of candy again this year, chocoloate covered candied orange rinds, peppermint marshmellows dipped in chocolate, and carmel corn of course! I made Lisa’s sugar cookies for the kids to roll out, bake and ice! Kendra even mixed them up so I did very little in the cookie department this year! Missed you at Christmas get together.